Conservation: promoting the preservation of wildlife, habitats and landscape. Development: supporting a better understanding of nature and global issues. Learning: fostering a sustainable economy and society. Visit their website by clicking here to find out more about the Biosphere plus all the latest news and events. We’ve binoculars to view the abundant bird and animal life surrounding Straiton, plus there are books on the flora fauna so you can identify what you’ve just observed. The Biosphere also promote cultural heritage and local products. The conservation village of Straiton is a great place to view traditional Scottish rural architecture, local produce include Barwheys Cheese (made near Kirkmichael), and Dorothy’s cakes are justly famous in The Buck. A little further afield the Galloway Forest Park is a great place to walk, cycle, fish or just commune with nature. And at night we’ve some of the darkest skies in the world making it perfect for star gazing. 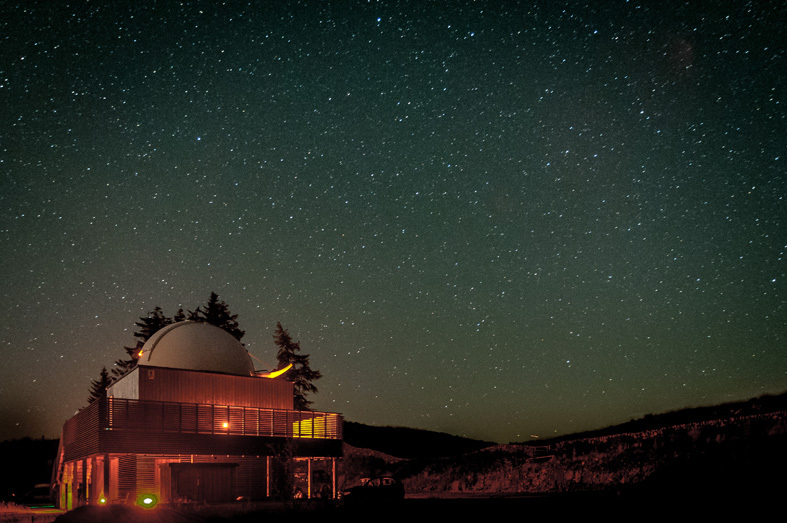 The Scottish Dark Sky Observatory (pictured) at Craigengilllan has a varied programme of events throughout the year. Posted in Uncategorized on April 29, 2015 by Bea Holden.